New product launch is a moment of high vulnerability. There is always a thrill associated with revealing to the marketplace your best efforts and waiting to hear the accolades and collect the profits. There is also the very great fear that big investments have been made to birth the new product and the accolades and profits won't come. Fear of missing the mark with a new product is very real and very big. Confidence can replace fear if the foundation of the new product development project is laid early and vetted thoughtfully. Success in developing new products only comes when three factors are all supportive. Existence of a Convincing Market Opportunity is the first necessary factor. Adequate Resource Capabilities is the third necessary factor. Each of the three necessary factors supports new product success like three legs support a stool. 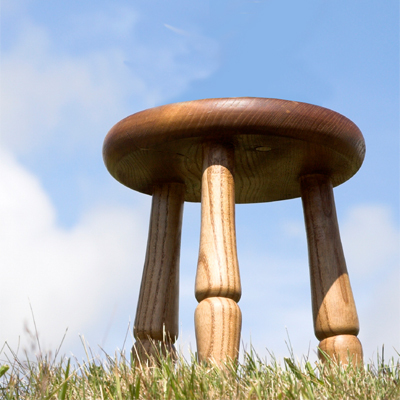 Stool Leg #1- Convincing Market Opportunities are identifiable by the unique constellations of customer, supplier and competitor information that surrounds them. Federici Business Group spots these constellations by a combination of voice of the customer and supplier data collections, competitive environment and market trend analysis. This information is used to highlight gaps in the product offerings already in the desirable market, which in turn are used to define prospective new product concepts. Not all new product concepts defined from current product gaps are worthy new product candidates. At Federici Business Group, we follow the principles of J. Cagan and C.M. Vogel (“Creating Breakthrough Products”, Pearson Education, Inc., Upper Saddle River, NJ (2002).) and submit every prospective new product concept to SET analysis before making a recommendation for commercialization. complimentary market strategy and adequate resource capabilities. Stool Leg #2- Consistency of the Market Strategy with Company History. Being first-to-market is not the only choice. Consider Apple Computer and its iPod product. There were plenty of MP3 music players available for sale when the iPod was launched and now the iPod owns the market for MP3's and downloadable music. Generally there are four recognized market strategies: First-to-Market, Analyzer, Defender and Reactor. They can all be profitable. They are all risky in different ways. Federici Business Group can analyze for the market strategy that works best for your company and which among the competing new product candidates aligns best with that strategy and risk taking profile. do before embarking on a new product development project. Sometimes less obvious is that competing new product candidates require different resources and different amounts of resources to commercialize. A relatively low risk new product development project can become unsustainable if proper expertise, facilities, materials, technology, environmental precautions, time or money are not there when needed. Ensure commercialization to completion and successful market launch by having Federici Business Group help vet those new product candidates whose resources requirements are within grasp. Go to Market with the Confidence! Have Federici Business Group help Your New Product Development Process through Consulting, Training, and Facilitation.